Clear Cost is Telecom Expense Management (TEM) software designed to help you lower your carrier costs. By simplifying the review process with interactive analytics you can quickly identify problem areas . 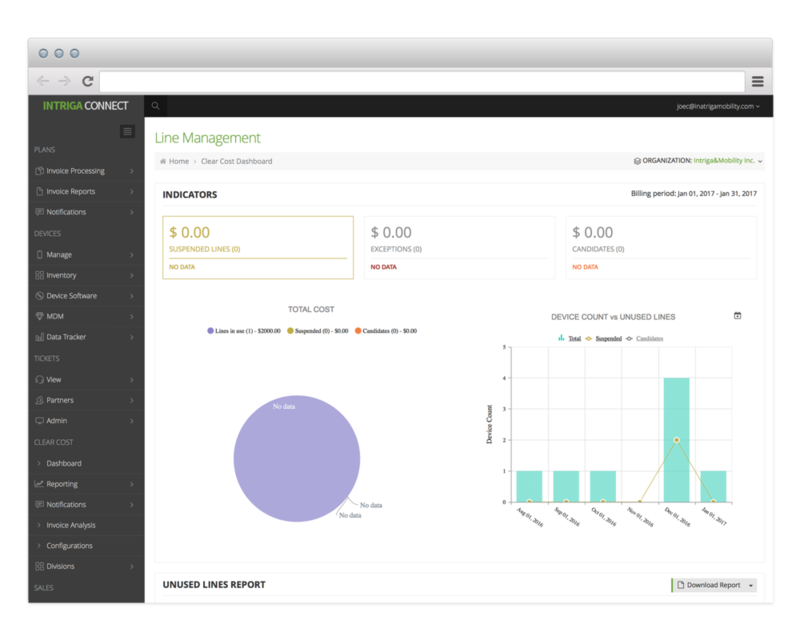 Improve line management, allocate features & plans properly, identify behavioural issues, and address contract features all in a centralized console. Focus on what matters and drill down when needed. Investigate issues, and allocate financial expenses across your organization. Stop working with complex, homegrown and error-prone Excel worksheets. Work online in a modern environment and improve your efficiency. With interactive graphing tools, and easy-to-understand trending analysis, you'll get a clear picture of your mobile fleet to identify what matters. Investigate a specific device with a micro-view of all reporting functions including: cost, usage, policy, expected cost, and line state. Compare actual costs and device usage against expected costs and usage policy. Discover and suspend unused lines. Drill down into lines that shouldn't be active and uncover potential savings. Deliver cost and usage detail directly to employees through email, push notifications, and click through portals. Prevent unnecessary costs, at the source, before they accumulate. Send group summary detail to to managers; let them decide how to address employee costs and usage. Pull comprehensive reports by cost, usage, and division or create custom reports quickly and easily. Set and manage usage policy for data, text, and voice. Identify which devices are violating policy. Allocate the expenses to the appropriate cost centres or accounting codes and upload directly into your financial system. A PDF summary of all features can be downloaded for reference.